■SOLD OUT■QUOTE REQUIRED■ This means that when we receive your emailed request, we'll check this item's availability and answer you with a quote. Through sensory activities with the Puzzle Maps, the children begin to build their knowledge of world geography. The silk screened maps are laser cut. Laser cutting insures accuracy and the availability of replacement pieces. 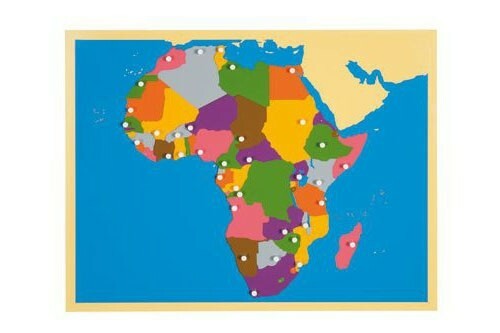 Specially designed knobs on each puzzle piece are positioned on the location of the capitals of the countries and states. Includes plastic circle for tracing the hemispheres. The trained Montessori Guide is prepared to give an appropriate presentation of one puzzle map at a time, starting from simple to complex, to children as young as 2 ½ years of age. A different procedure for the presentation lesson of this map must be followed for elementary students. The printed notes of this Montessori presentation from our CME Teacher Preparation Course are available for purchase from this web page under Puzzle Maps Presentation.